Last week, about a month into the fermentation of the sauerkraut, I skimmed off the last bits of mold that had formed on the surface water and jarred up the sauerkraut. I gave it a taste beforehand and it tasted pretty good. Still crunchy and there was no mold growing on the actual cabbage itself. Will I make sauerkraut again? Maybe. I know we will have more cabbage in the garden in the future and it is hard to eat it all so I may end up doing this again. I might try the jar method next time. I only put the sauerkraut in the jars and stuck them in the fridge. 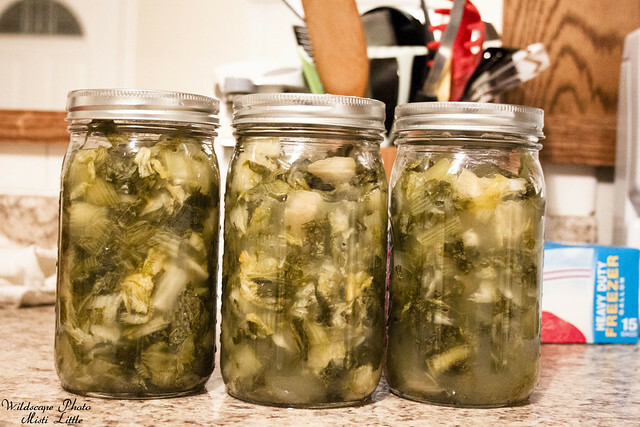 While some places say to put them in a hot water bath, most blogs I read were against that because all of the good things from the lacto-fermentation would be killed in the process. Storing it in the fridge will keep other molds and bacteria at bay and it will last in the fridge for several months. I have yet to eat any of it; I need to think of a meal to pair it with. Miss the original post on starting this whole process? Read it here. I can’t wait to hear how it taste. I have never had it with the type of cabbage you used. Nan always used the heads of cabbage (what ever that is called).